Born in Nynashamin, Sweden, this centreman was with the Winnipeg Jets for four WHA seasons. In 300 games he scored 140 goals, 344 assists, 484 points. He played on the "Hot Line" with Bobby Hull and Anders Hedberg and was a First All-Star twice. 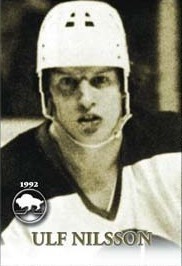 Ulf Nilsson also won two Avco Cups (1976 & `78). Injuries limited Nilsson's NHL career with the New York Rangers to only four seasons, 170 games, 57 goals, 112 assists, 169 points.